The Lorain Sports Hall of Fame proudly announces its 50th Anniversary Class of 2019 Enshrinees. The group will be enshrined at the LSHOF banquet on May 11 at German’s Villa. Tickets will go on sale at the beginning of March. For ticket information, contact Ron Feldkamp at 440-244-3449 or Tom Bauer at 440-213-8719 or by email at tbauer0403@gmail.com. Ron Mantini, Basketball/Baseball, Lorain Catholic High School (1995), California University of Pennsylvania. We’ve got a new gallery of photos previewing items in the LSHOF Museum collection — check it out here on our Museum page. In addition, the Museum page includes a link to the restored the Lorain High Yellow Brick Road photo section displaying historic pictures spanning more than a century of sports. The Lorain Sports Hall of Fame will have a fundraiser steak fry on Sunday, March 3, 2019, from 4 p.m. to 7 p.m. at the Amherst Eagles Aerie 1442 located at 1161 Milan Avenue in Amherst. Dinner is $25 per ticket and includes a steak, baked potato, salad, roll, beverage and dessert — $5 of the ticket price goes for a 50/50 raffle. A basket raffle also will be held. Extra 50/50 tickets will be available for $5 each or three for $10. Call Bambi Dillon for tickets or any questions at 440-989-6539. Mark Sunday, Aug. 4, 2019, on your calendar for the Annual Golf Outing to benefit the Lorain Sports Hall of Fame. Watch here for details to come, or see our page on Facebook @LorainSportsHallofFame. COLLEGE PARK, Md. — On the list of obvious Ohio State targets for a game-saving fourth-down play in overtime, Rashod Berry wouldn’t have made the top five of Buckeyes likely to be called upon Saturday. There’s running back J.K. Dobbins and H-backs K.J. Hill and Parris Campbell and receivers Terry McLaurin and Johnnie Dixon. But then again, Berry, a 6-foot-4, 259-pound junior from Lorain, might be the best athlete on the Ohio State roster. 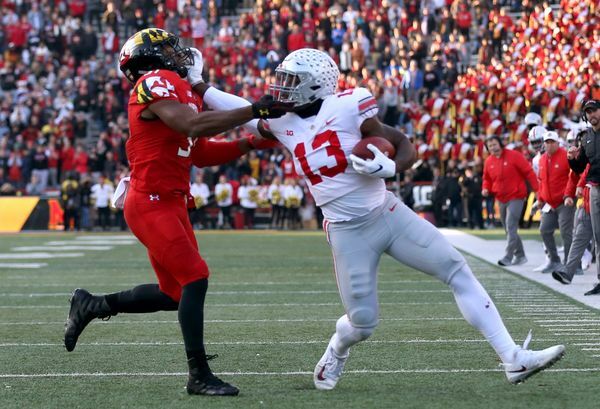 And then again, the quick throw to Berry that worked to save a win over Maryland is the closest thing Ohio State has to a go-to secret play in times of trouble. Saturday, May 11, 2019, is the date of the next Lorain Sports Hall of Fame Enshrinement Banquet. Be sure to save the date on your calendar of events to attend. Meanwhile, you can visit the LSHOF Museum at Lorain High School and Like us on Facebook. As always, our website has details and photos about all the LSHOF enshrinees plus details about visiting the LSHOF Museum at Lorain High School and attending our special events throughout the year. Tuesday-Wednesday-Thursday 11 a.m. to 2 p.m.
Sept. 30, 2018, is the fast-approaching deadline for nominating Lorain athletes you think are worthy of induction into the Lorain Sports Hall of Fame. The nomination form is comprehensive and takes time to complete, so don’t wait. You can find eligibility rules at this link and you can download nomination forms at this link. The next enshrinement will take place in May 2019. Reminder: The LSHOF museum at Lorain High School is closed for the summer. It will reopen in late August when school resumes.